Theatre Under The Stars | Trevor Boffone, Ph.D.
After I saw In the Heights on Broadway in 2008, I left the Richard Rodgers, went to my hotel room, and immediately tried to break dance. Hilarity ensued. Graffiti Pete I was not. Fast forward 8 years to Theatre Under The Stars’ (TUTS) production of Lin-Manuel Miranda and Quiara Alegría Hudes’ hit musical, and I am still trying to move like the fictional residents of Washington Heights. Dear reader, I have never and likely will never be able to break dance, pop-n-lock, or anything in between. No amount of In the Heights will fix that. But that doesn’t change my relationship with the show. As a musical theatre-phile and Spanish-speaker, seeing the show in 2008 was the first time that I felt these two worlds collide. Even though I am not Latino and don’t necessarily relate to the characters in the show, I felt represented in some odd way. And, as a Latin@ theatre scholar, I’m invested in the skyrocketing careers of both Miranda and Hudes, two of only three Latin@ playwrights to win the Pulitzer Prize for Drama (the other is Nilo Cruz). In many ways, I feel like In the Heights always keeps coming back to me. And then one night you are scrolling through your Facebook news feed and there is In the Heights embroiled in controversy over the casting and hiring of artistic staff at Chicago’s Porchlight Music Theatre. Enraged, I checked my facts, and wrote a blog, thinking that no one would read it (See: “Casting an ‘Authentic’ In the Heights”). The next day it quickly went viral (well, viral for trevorboffone.com). All of a sudden, people were citing me and interviewing me about my thoughts on race, ethnicity, and casting in the show. Soon thereafter, I started writing an article about race, ethnicity, power, whitewashing, and representation in post-Hamilton productions of the show to submit to a peer-reviewed academic journal. And all the while, I was keeping my eyes on TUTS’ 2016-17 season opening performance of the show. 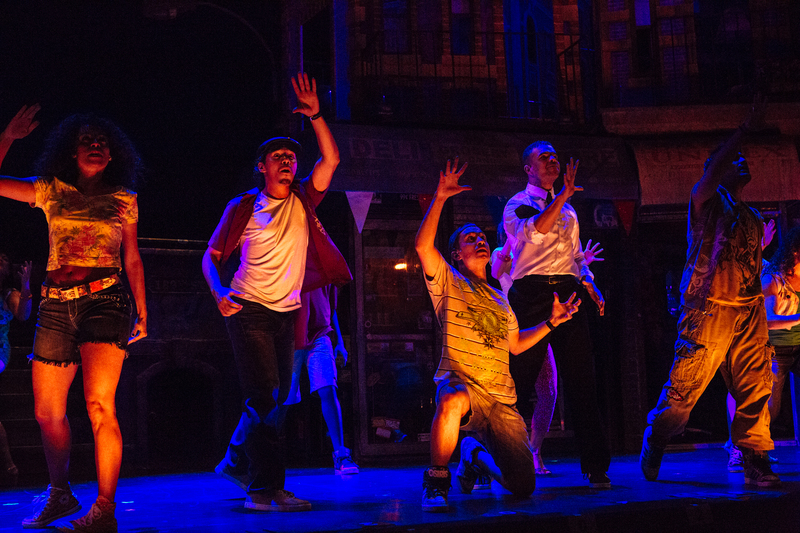 While I won’t formally review the show here and will save my detailed thoughts for later, I do want to take some time to address several thoughts about TUTS’ production of In the Heights. Usnavi is everything—When Usnavi makes his entrance at the top of the show, he introduces the audience to the familia to which we are about to bear witness. He is the show’s narrator and, therefore, we enter the community through him. Given this, the actor must be able to carry the show, not in the same way as Mamma Rose or Tevye, but Usnavi must make the audience fall for him. We need to not only want to visit his bodega, but we need to feel like we already frequent it and take our coffee light and sweet. This is to say that casting this character is pivotal to a successful production that speaks with the Latin@ community. As such, Usnavi is a beloved musical theatre character and one of the few Latin@ characters to lead a Broadway musical. TUTS made a great choice in casting Anthony Lee Medina as Usnavi. Medina’s tweet below just shows how much this role means to him and the Latin@ community. Not to mention it reiterates the importance of casting this role with a Latino actor. How often do Latin@s get to play dream roles that are roles specifically written for them? Stepping into a role so closely associated with Lin-Manuel Miranda surely must have been daunting, but Medina delivers as the man in the Kangol hat. Medina is charismatic, funny, and engaging. In addition to being a first-class actor, he raps with ease and dances like a drunk Chita Rivera. Medina is ready for the spotlight and there is no reason he shouldn’t play Curly, Pippin, or Bobby (give him a few years!). Sheldon Epps—Last week, I told The Houston Chronicle’s Theatre Critic Wei-Huan Chen that Sheldon Epps leadership as Artistic Advisor at TUTS was a big move in a city whose major arts organizations are so heavily run by Anglos. Given the fact that Houston is the nation’s most racially diverse city, a black person in such a high leadership position shouldn’t be surprising nor should we consider it a “big move,” but here, in 2016, it is. That Epps came in and replaced Shrek, Jesus Christ Superstar, and Grease with In the Heights, Into the Woods, and Dreamgirls just demonstrates that he is looking to center TUTS as one of the leading producers of musical theatre in the country and produce work that speaks to Houston in 2016. While In the Heights and Dreamgirls offer a rare opportunity for local audiences to see people of color on a major stage (How many times have you seen two dozen people of color on stage at the Hobby Center? ), Into the Woods also offers the opportunity to cast people of color in leading roles. Why not a black Baker? Or a Latina Baker’s Wife? An Indian-American Jack? Simple casting choices could potentially have a significant ripple effect in Houston. Just look at the new layers that The Catastrophic Theatre added to their 2016 production of Buried Child by casting a black woman as Shelly. To put it simply, it was a revelation and shed new light on a show that has been around for almost 40 years. We need more of this work and TUTS can be be a leader in providing access for actors of color in Houston. Hopefully, programming diversity on stage will bring more diverse crowds into the Hobby Center. However, if TUTS really wants to build audiences and draw new people to the theatre, then it absolutely must address the high cost of tickets. The cheapest seats for In the Heights are $46.50 including fees, not to mention parking which is $12 in the Hobby Center garage. Why not offer discounted tickets for veterans and people under 35, rush seats, etc? TUTS does have a Student & Senior Rush Policy (Student and Senior (65+) rush is available starting one hour before curtain with valid id. Tickets are 50% off in price levels 2-5). However, this information is not easily accessible on their website, leading many to believe that they don’t offer such discounts. 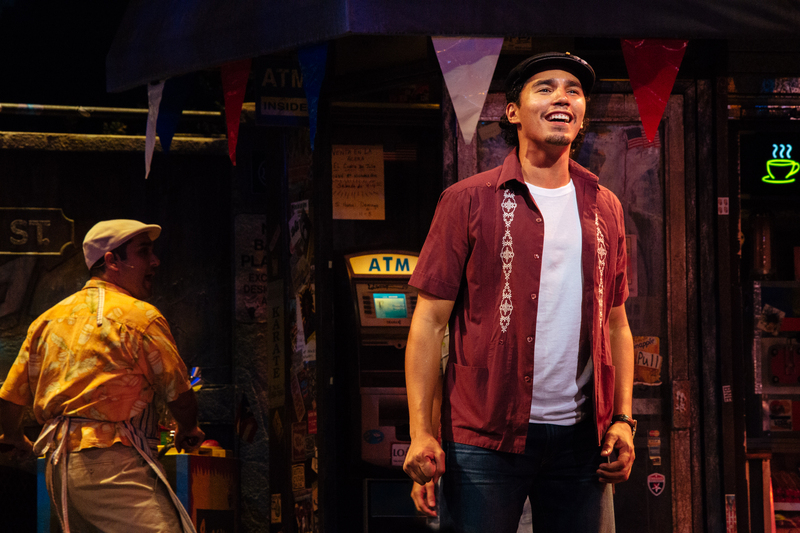 I recognize that with touring shows discounted tickets might not be possible, but for TUTS-produced shows such as In the Heights, discounted tickets have the potential to be a game changer. In the Heights should not be a luxury. People should not be turned off from seeing this important show based on ticket prices alone. This entry was posted in Uncategorized and tagged Anthony Lee Medina, Houston, In the Heights, Latina/o Theater, Latinidad, Lin-Manuel Miranda, Performance, Quiara Alegria Hudes, Sheldon Epps, Teatro, Theatre Under The Stars, TUTS on September 16, 2016 by trevorboffone.